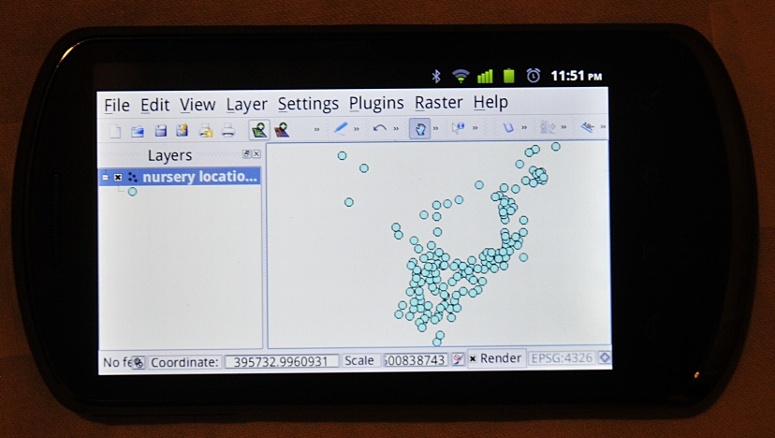 I mentioned before that QGIS was being ported to Android. I couldn’t try it out at the time as my phone was still running on Android 2.2. However, I just managed to upgrade my phone to Android 2.3 and of course I had to try out if I could QGIS to run on my phone. And it works, see the picture above. Displaying a shapefile (point layer with 1650 points), including zooming in and out works without problems. Trying to open the attribute table sadly crashed the app, but to my surprise I could even edit the file (adding points). And it is still in alpha stage, so we can expect a lot more to come. Of course, one may wonder who in his right mind wants to work on GIS on a 3.7 inch touch screen (but see here). However, certainly for tablets, I can see this could become a very useful application (e.g., for vegetation surveys or other kinds of fieldwork). You can get more information or the application itself on android-qgis page. And this blog gives a bit more background on the development of this QGIS port. wow, that´s something nice. Does your phone have a GPS receiver and do you think that is can be or will be linked in the near future? Yes, it does, although I normally use an external GPS via Bluetooth (faster locking on the satellites and more accurate). As for the GPS support for QGIS, it is already there; see this blog post. You can connect by enabling the mock locations provider. It would be nice to be able to display satellites and signal strength directly from within QGIS. I have no clue how difficult it is to implement this (not very easy obviously, otherwise you would have implemented it already). It should be possible though, Locus for example can connect directly to my blue-tooth GPS and display satellites and signal strengths.